One of a Kind Ice Skate Deals. While supplies last - in most cases there is only one pair. Coupons and free shipping do not apply. Roces J Due JR Girls F Adjustable Ice Skates - Size 4-7 - DEAL! Ladies Adjustable Ice Skate size 4-7 ladies LAST PAIR. made in Italy Roces J DUE JR F Adjustble Ice Skates for recreational and figure skating. Roces T Ice 10 Mens Ice Skates - LAST PAIR ON CLEARANCE! SIZE 16 - For recreational skating. 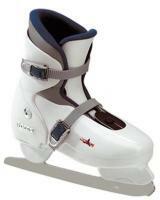 Great for ice skaters who want the most comfortable boot available, without sacrificing any performance. Allows longer skate sessions and improved control and stability. Equipped with super strong base and blade. MK Blades - Professional Figure ice skate blades 7 inch. LAST PAIR. Free shipping does not apply on this highly discounted blade pair.